There are many sites that offer app reviews, list app price drops and announce limited time free app offers. But any attempt to scan this information quickly leads to a frustrating experience. These review sites rarely have any way to view an apps' screenshots, user reviews, or videos related to the app. It can take precious time and clicks only to find the app does not interest you in the least. We now offer the best of both worlds with our Watch List. 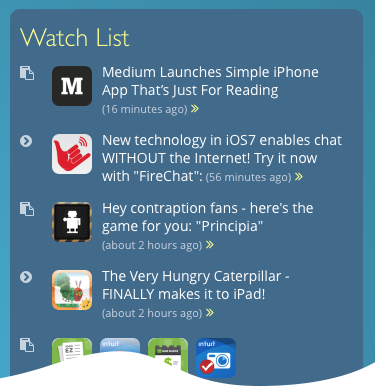 The Watch List resides on the right side of the main search screen at all times and is constantly auto-updated! For more details, you can click the app and get user reviews and videos and more - still without leaving the comfort of your current page. Close the details window and you will see that you haven't left! Its all designed to keep our users informed and allow quick checks of Watch List announcements while minimizing any disruption of your task at hand!